Kitchen Drawer Inserts – Slide Out Shelves LLC. Free up the clutter in your home with our custom made Drawer Inserts and Drawer Organizers. Simplify your kitchen organization with pegboard drawer systems, cutlery trays and spice rack block inserts. From bathrooms to kitchens, our drawer inserts and organizers offer custom storage solutions for any home. Turn Chaotic Kitchen Drawers into Efficient Storage Spaces! Kitchen drawers are used most often in any household. Most drawers resemble a chaotic mess without any organization whatsoever. With Slide Out Shelves LLC’s drawer inserts, you can turn any messy drawer and hard to reach cabinet corners into organized and efficient storage spaces. 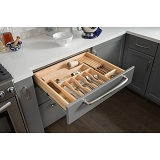 Our collection includes a number of options such as made to fit cutlery drawer inserts, drawer peg organizer and knife block drawer insert among others. All of our designs can be customized to help you keep the contents tidy and structured properly. Our kitchen drawer inserts not only help you keep everything neat but also simplify your cooking experience with easy access features. Our range is made with maple wood with a natural finish to increase the aesthetic appeal of your kitchen drawers as well.